Happy Saturday, ya'll! Once again, it's time for Jen's Sketch for You to Try. And today, I bring you one that features another new set being released on September 1st from Storage Units, Ink and More. (I know this card is really "busy", so don't let that influence your decision as to whether or not you like the stamps themselves. I got a little carried away! I'll give you a minute to go get your sunglasses, too.) The set is called The Witching Hour and also has a cute little witch and other images, some of which you can see HERE on Lauren's blog, and some you can see HERE on the SUINK blog--don't forget to go over there to try and win all 6 of the new sets being released! I decided to pull out my Prismacolor pencils again, especially so I could get a spooky black and gray look to the haunted house. The gray panel is Core'dinations cardstock which I sanded all over and more heavily on the edges. The little ghosties are covered in Stardust Stickles. (You can see by this point where I couldn't quit adding stuff--eek!) So, in this case, maybe "more is NOT more"! Anyway, I love Jen's layout and I would love for you to fly on over to Amy S., Amy R., Shannan's blogs for some more inspiration. Carole had some family "duties" to take care of, but has promised to share a SFYTT (SCS keyword when you upload yours) tomorrow, so be sure and check back (lamer)! Be sure and check out the schedule below in my last post for more SUINK sneak peeks! TIP: Just run your stickles along an edge and pull the glitter glue to the inside of your image with the tip for more even coverage and less of an "outlined" look. You can also do this with a small paintbrush. BONUS TIP: Through trial and error, a friend of mine learned that Odorless Mineral Spirits will take off paint (paint pen in this case) from plastic with no residue or damage to the finish. Love your ghostly creation Susan!! This card is wonderful. I love how you used the spooky elements on such a colourful and lively setting/background. Excellent job! I don't think the card is too "busy", I think it's just perfect. I love it--those new stamps are sooo cute! It's not busy at all--just perfect! Susan!! This is awesome!!! Oh my gosh, I love the haunted house, and the popped up ghosts. I don't think it's busy at all! Super cute, Sus! I love it! Your card is too fun! I love your creativity! Ok, so I just hafta say...every time I see something you've created, you just amaze me more and more with your awesome details. I'm such a chix...never want to try the *outta* the lines/circle thing, and you've done it so perfectly! 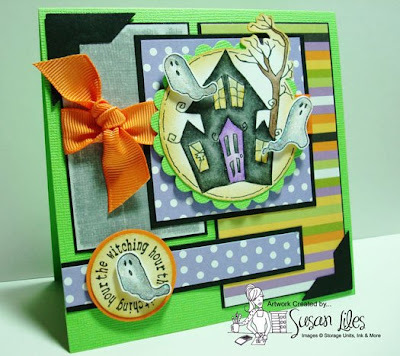 Love the poppin' ghosts and your circle sentiment belly...too dang key-ute! oh my! this is fabtastic!! Love the layout and all the elements! Hi!! I don't know where I've been but I just found your Blog and I LOVE it!! I can't wait to get updates!! I think it is fantastic!! Love those images!! A great card, I love the image! It's not too busy at all! I love this card!! Yes I used this sketch and forgot to mention it! I love your card and was inspired! Thanks for the comment!